A school or district-wide common language with symbols, planners, checklists and rubrics begins in kindergarten and continues through the grades. At each grade level teachers build on the skills and common language learned in the previous grades, increasing efficiency. One skill builds upon another. Following best teaching practices, skills and genres are spiraled to help students internalize the knowledge and application process. with everything teachers need for thirty-two weeks of school. 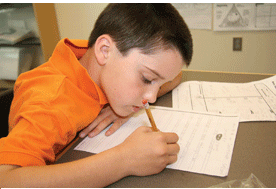 Four-step explicit language instruction begins every week. 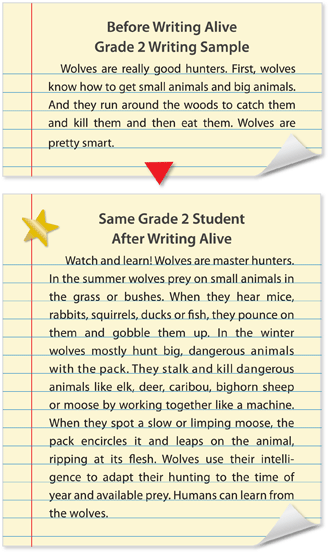 Students follow the writing process and revise using the same skill. Our schools' (schools who have adopted the Writing Alive Curriculum and Professional Development) test results stand as a testimony to the effectiveness of a systemic, systematic curriculum beginning in preschool and continuing through middle school. Growth is magnified by a common language. Keri Bade, fifth grade teacher at Red Hawk Ridge, received an award for the highest growth in her school district. She explains, “My school has been using Writing Alive for six years and by the time the students reach me, they have been using Writing Alive since kindergarten. As a result, they are so far ahead of any other class that all I do is build on their skills.” Writing continues to improve every year! Writing Alive progress is cumulative!